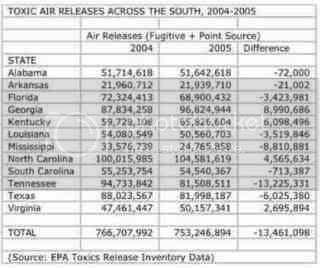 A Facing South analysis of the Environmental Protection Agency's 2005 toxic release inventory data for states across the region offers some good news and some bad news: While air pollution emitted by the region's industrial facilities declined slightly from the previous year, the amount of pollution dumped into surface waters increased. Though toxic air emissions throughout the South fell about 2 percent from 2004, several states across the region actually experienced increases. They were Georgia, with an increase of more than 8.9 million pounds; Kentucky at more than 6 million; North Carolina at 4.5 million; and Virginia, 2.7 million. Those figures represent point-source and fugitive emissions combined. 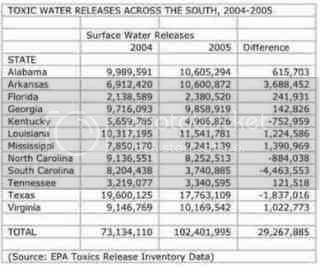 At the same time, emissions to surface waters were up 40 percent across the South from 2004 to 2005. Several Southern states showed increases in amounts exceeding 1 million pounds. They were Mississippi, with an increase of about 1.4 million pounds; Louisiana at 1.2 million; and Virginia at just over 1 million pounds. Annual changes are not unusual. A number of possible reasons for the increase include: production increases, fluctuations in the content of raw materials used in particular industries or changes in releases at large facilities that impacts the national data. "When you look at the data, it has gone down," said Richard Harrell, a permitting officer at the Mississippi Department of Environmental Quality. "It's good news because you can see some downward trends even before the storm." Harrell said it is hard to predict whether emissions remained lower in 2006 and 2007 after plants came back online. An EPA review of the last five years of data shows reported chemical releases have decreased by 22 percent nationally. Environmental advocates attribute that in part to TRI reporting requirements, which have shined a public spotlight on toxic emissions and pressured polluters into cleaning up their act. The TRI program was created by Congress in the 1980s after a Union Carbide pesticide plant in Bhopal, India released a cloud of toxic gases that killed and maimed thousands of people. However, the Bush administration has rolled back TRI reporting requirements, making it more difficult for citizens to monitor pollution in their communities. Late last year, EPA finalized rules that raised the TRI reporting threshold for polluters to 2,000 pounds per chemical. And in January of this year, President Bush issued an executive order exempting federal facilities from reporting to TRI -- a move that will primarily benefit Department of Defense facilities, according to an analysis by the National Environmental Trust. U.S. Sen. Frank Lautenberg (D-N.J.) and U.S. Reps. Frank Pallone Jr. (D-N.J.) and Hilda Solis (D-Calif.) have introduced legislation that would return reporting thresholds to their previous levels and block any further rollbacks in the public's right to know. Meanwhile, a report slated for release next month will show that all this toxic pollution is having an especially heavy impact on minority communities. This year marks the 20th anniversary of the United Church of Christ's landmark 1987 report, "Toxic Wastes and Race." In commemoration, UCC commissioned a new report titled "Toxic Wastes and Race at Twenty," which assesses the extent of racial and socioeconomic disparities in facility locations. * People of color make up 56 percent of those living within 3 kilometers or 1.8 miles of the nation's commercial hazardous waste facilities. * People of color make up 69 percent of neighborhoods with clustered facilities. * Nine out of 10 EPA regions have racial disparities in the location of hazardous waste sites. At the same time poor and minority communities are being forced to shoulder a greater toxic burden, the government is cutting programs designed to address the problem: President Bush's Fiscal Year 2008 budget recommends a 28.4 percent cut to EPA's Office of Environmental Justice. "The steep budget cuts will result in fewer EPA grants for communities and will no doubt hinder environmental justice implementation," according to a UCC statement.